Somebody Up There Hates You by Hollis Seamon. Review: When everything in life goes badly, it's only logical to place blame somewhere. For Richard Casey, a spunky teenager who is awaiting his last days in the hospice unit, there is only one culprit - the "Big Dude." In Somebody Up There Hates You by Hollis Seamon, Richie is determined to make his last days count! Richie has lived through it all - chemotherapy, radiation, surgery after surgery, but he finds as he faces the end that he really hasn't lived at all. Determined to make up for all the lost days ahead of him, he embarks on a journey to truly live. Then Sylvie, a sixteen-year-old patient across the hall throws a wrench in his plans as she, too, wants to live - at least until she is taken away for good. Together they grow up, face the world, and even face their fate. Richie's lust for adventure and self-discovery alongside Sylvie's drive for love bring about the wonders of life, but they also create the wall that is forced eventually to divide them. 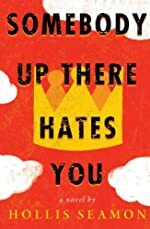 Somebody Up There Hates You is a unique coming-of-age novel where the author shares a glimpse into the life of a teen whose fate has already been decided. Not only is the sadness shared, but also the humor and need to feel alive. Richie is presented in such a way where readers are drawn in instantly. His raunchy, funny, and authority-challenging character appeals to teens, and readers quickly forget he's dying. His frankness from which he views life makes a depressing topic exciting. "Hey, I'm totally reliable, sweartogod. I, Richard Casey - aka the Incredible Dying Boy - actually do live, temporarily, in the very hospice unit I'm going to tell you about." Richie's goal by his end is to experience "it all", and although authority figures try to stand in his way with every roll of the wheelchair he makes, his determination (along with Sylvie's determination) make "growing up" in the face of death actually possible. This life-affirming novel will make readers laugh and cry as they see that life is worth living - even if it's only for a short while. We would like to thank Algonquin Young Readers for providing a copy of Somebody Up There Hates You for this review. Have you read Somebody Up There Hates You? How would you rate it?